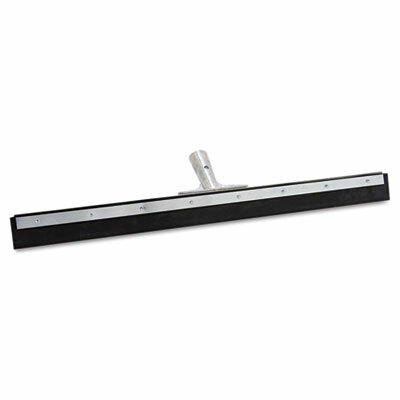 14-gauge galvanized steel frame squeegee with black EPDM rubber. Digs deep into tile crevices and uneven surfaces to remove liquids, leaving floor finger dry. Removes dirt from grout. Socket accepts any tapered handle (sold separately). For large volumes of water, mud, debris, waste, scrap, slush, snow and flood clean-up. Galvanized steel frame with cast zinc socket. Features 2" replaceable black rubber. Click here to see more Squeegees! Blade Material: Rubber Blade Width: 24"
Handle Type: Straight Handle Length: 3"
Blade Color: Black For Use With: Unger 61" aluminum handle with three-degree taper (UNG-AL14T, sold separately).